In a large bowl combine the rice, spinach, and tofu. Now, reserving a bit of each for garnish, stir in the olives, and red onion, pine nuts and olive oil. Now stir in 1/4 cup of the cheese. In a small bowl whisk together the eggs, and salt. Fold the eggs into the rice mixture, pour into the prepared baking dish, and sprinkle with remaining cheese. Bake for 30 minutes or until the casserole is set, and the top toasty and golden. 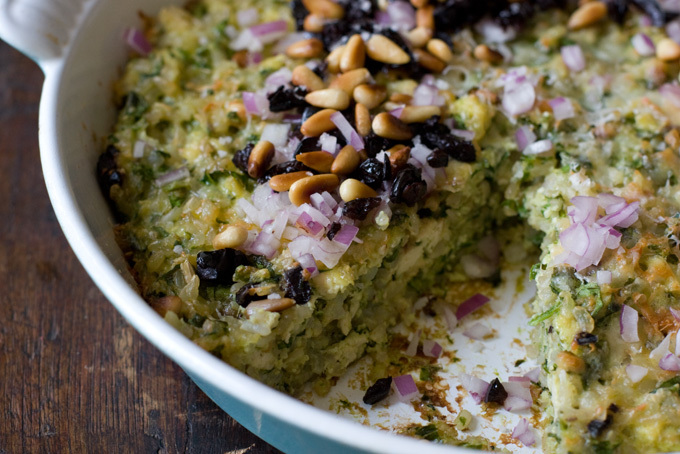 Remove from the oven, and sprinkle with remaining onions, olives, and nuts. Sprinkle with a bit more salt before serving – or taste and get a sense of whether you need any.